By taking a closer look at the most basic road problem such as rutting, cracking and potholes, an expert will be able to conclude that by and large it is not the asphalt itself that is to blame; it’s the base. Nevertheless, the most common methods of repair that are used involve merely sealing the cracks, covering it up with an additional layer of asphalt called an overlay, and filling in the holes. However, over time, this accumulation will eventually be milled down so as to make room for another overlay while the real problem of insufficient base or filling is never addressed. Therefore, it is just a matter of time, and the cracks and holes reappear in a cycle that is seemingly never ending. To that end, the asphalt reclamation would be the most efficient technique of stabilizing the base course. Primarily, road restoration involves a 4 step process of recycling asphalt, whereby the entire existing pavement is treated and pulverized to be used as an improved and new base. Arguably, this process offers an environmental-friendly, time-saving, and cost-effective solution for road construction. The reclamation procedure allows for shoulder widening, structural resurfacing, replacement, shoulder, and pavement restoration. Additionally, asphalt refurbishment is useful when repairing roads that have highly deteriorated and which require fundamental improvement due to cracking, surface rutting, inadequate sub-base materials, design deficiencies, and pavement failure. 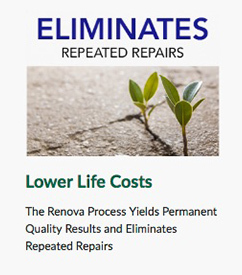 Ideally, this procedure can result in up to an extended lifespan of 20 years to the original construction. It does so by eliminating pavement distress factors such as reflective, alligator, longitudinal, transverse, thermal, and fatigue cracking. Rebuilding the road base using the asphalt reclamation has many benefits. Such advantages include trimming down the costs of maintaining the highway for up to 40% over a period of five years. Furthermore, it lessens emissions and conserves fuel by having less equipment on a project. Even more, it upholds the national resources by reprocessing the existing materials. 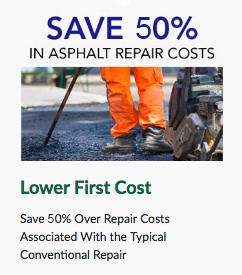 Importantly, the asphalt reclamation has been proven to be longer-lasting, less expensive, and faster. Notably, with this process, the projects that would usually take a week or more can be performed in as little as a single day. 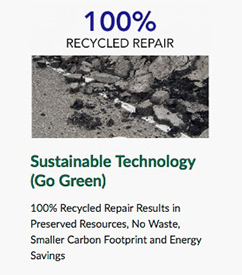 Additionally, the cost savings can average up to 70% or more as a result of reusing the existing materials in place and the time saved. Best of all, now that the base problem is solved and not just covered up the outcome will last years longer.